The British colony was formed Hong Kong in 1841. Later on, businessmen from all corners of the world began to settle here. As the colony started to grow, the needs of quality restaurants also became need of the hour. Chefs in Hong Kong learned to make gourmet Cantonese food that catered to businessmen. 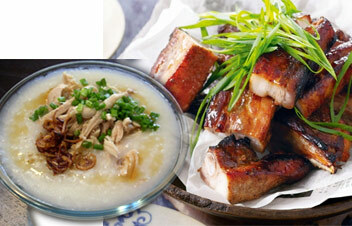 Peasants ate affordable “char siu” and “congee”, while businessmen ate costly braised shark type of food. During Chinese Civil War in 1949 many non-Cantonese refugees moved from the main land to escape from the Communist rule and they settled in Hong Kong. Even after the British Legacy, many expatriate Westerners stayed back in Hong Kong. It resulted the need of Western food in the restaurants. In due course Hong Kong’s traditional milk tea and egg tarts became popular and restaurants started offering to its guests. After the economic depression, restaurants in Hong Kong began to mushroomand more people started eating outon a regular basis. As Hong Kong has a long sea coast,Seafoodis affordable and widely consumed. By 1980s the food styles of Japan and South Asia became popular and restaurants began to try foreign ingredients in their cuisines.Here food enthusiasts can experience authentic cuisines from Korea, Japan, Singapore, Thailand, India, Malaysia, Vietnam, Europe, and America. Because of this Hong Kong is known as the "World's Food Fair." From street food to high end restaurants, the city offers a wide variety of eateries across the globe. The residents in Hong Kong are basically Chinese origin. The traditional breakfast includes rice porridge and oil fried bread sticks. However, western breakfastsare also getting popular which includes bread, pancakes, sausageand eggs.For mid-day and evening meals, normally Chinese food with rice is consumed. Most common ingredients used are Chinese cabbage, kai-lan, red beans shiitake mushrooms, hoisin sauce, dried scallops,salted duck eggs, dried shrimp, jujube, and lotus seeds. Sweet and sour pork is probably the most famous Hong Kong food, which is even available across the world in Chinese restaurants. Wontons are known as chāoshǒu which will be added to a clear soup along with other ingredients, sometimes deep-fried. Depending on the region and cooking methods, several shapes are common. Sichuan-style wontons are the most famous one. It is famous its rich meat filling, thin skin and as soup made of chicken, duck, and pork simmered for a long time The taste texture is quite oily and smooth.Its Hong Kong style version will be with salted fish, without peppers. It's widely ordered in restaurants together with rice. Roast Goose, Wind Sand Chicken, Phoenix Talons (Chickens' Feet), Steamed Shrimp Dumplings (HarGow), Fish Balls, Fake Shark Fin Soup , Rickshaw Noodles,Eggplant with Minced Pork, Sago Mix, Hong Kong-Style Milk Tea, Pineapple Bread etc. 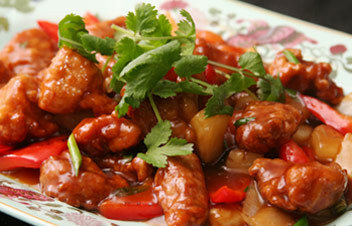 are also popular Chinese dishes.